I know I usually focus on new music, and I've got a ton of recent releases still to share. But this week we're going back a bit, because I've become re-enchanted with a release of an Indian fusion CD from five years ago. 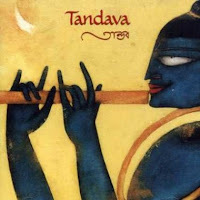 Vancouver Canada-based Tandava is a group "inspired by the folk and classical music of India and Bangladesh" -- while giving these traditions a contemporary sound by creative arrangements and the use of instruments unusual for Indian music, including guitars, erhu, and marimba. The result is a delightful acoustic music that transcends preconceptions about South Asia-rooted music, perhaps inevitable considering the group's four musicians diverse musical backgrounds. Tabla player Stafan Cihelka has studied under Zakir Hussain; marimba/percussionist Jonathan Bernard has studied in Beijing and Cairo; erhu player Lan Tung studied in Taiwan, China, and India; and flautist/guitarist Prashant John has traveled physically and musically from his home in Bangladesh through jazz, folk, and rock to his current home with Tandava (and his trio Lehera) in Canada. Tandava released their first and only CD in 2006, and their website doesn't show much sign of recent updates (sadly, the audio samples do not work). So enjoy this track, and if you like it tell them to get on the stick and make more music! This song, the liner notes say, is also known as "Dance Under the Moonlight." It is sung "to call the villagers to come out and dance in celebration of the harvest. This popular Taiwanese aboriginal melody has been transformed by the syncopated rhythmic treatment and vocal harmony."